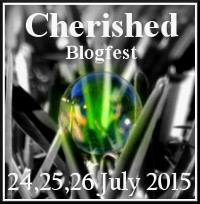 I discovered the Cherished Blog Fest via Dan Antion, at No Facilities. So what is my cherished possession? It is totally deserving of the term cherished. In fact this chest became quite a catalyst of inspiration. Reaching inside her camphor wood chest she delved for her secret lucky dip of stashed bits and bobs that she kept away from the prying eyes of her parents. Inside the chest were crystal books, pretty little stones, trinkets, a tattoo henna kit, and her much loved drum-sticks. She placed her art set in amongst all her precious things and closed the chest tight. An overwhelming feeling came over her that today would be a day that she would remember forever. It wasn’t just a dream! It had really happened, and the proof, the Red Jade Crystal, lay hidden in her precious chest of secrets. Hope you enjoyed my Cherished Blogfest. Do you have a particularly cherished possession that you’d like to share too? 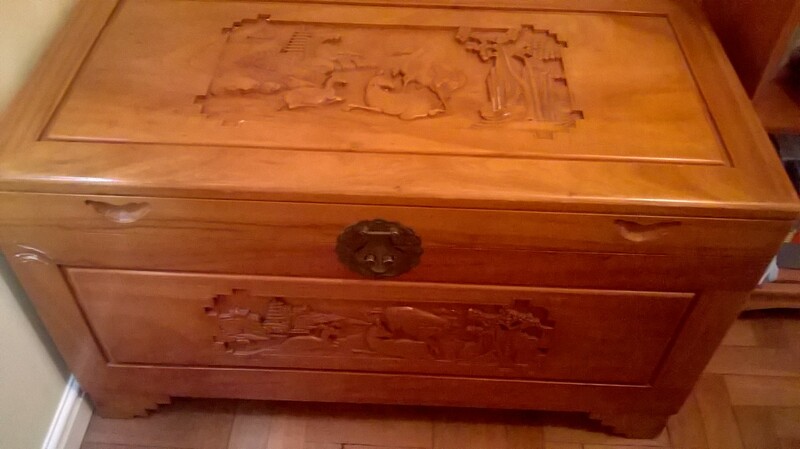 This entry was posted in Cherished BlogFest and tagged Camphor Wood Chest, Cherished Blog Fest, Memories, Oriental Furniture, Photographs, Precious, Secrets. Bookmark the permalink. This is beautiful! Not only does your chest come from a place of love, it keeps things you hold dear. Awesome! What a nice object – I lived in East Asia too, and those memories never left me. Thanks for sharing. I mainly lived in Hong Kong, Guagzhou and Osaka – 8 years all in all – and later in Seoul for a short while. What about you? I was born in Singapore, have been back quite a few times, once more recently with my children. My mother is from Kuching in Malaysia so have been there too. Never been to Japan, China, or Korea. Other than that grew up in Edinburgh, lived there until I moved down to Cambridge. I can see why you cherish the chest. It is beautiful, and holds lovely memories. Thank you! Yes, it is gorgeous. I don’t think my photograph does it justice. It is beautifully engraved. Treasure chest. 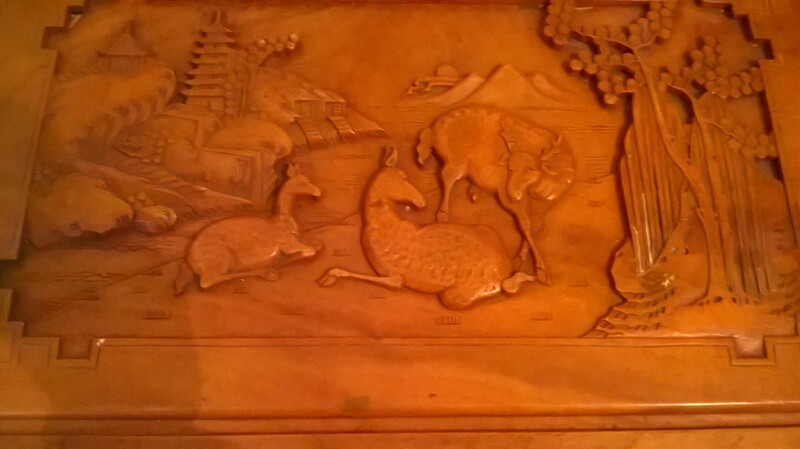 It’s so beautifully carved and truly priceless. Beautifully made, a gift from family and containing all your favourite papers. I can see why you chose this! I can’t imagine storing things we love in a cardboard box. Your chest honors the values it holds. Lovely written. Thank you Angelika, appreciate your kind comment. This is such a treasure chest. Thanks for participating in the Cherished Blogfest– I’ve really enjoyed reading your post. Wow…beautiful box, lovely excerpt! I guess we both have cherished heirlooms with little treasures inside. You are indeed a kindred soul, and I wish you the best of luck. Thanks for coming to my blog through #Cherished, I am so glad I participated. I need to do more of these, really inspires creativity, and I’ve “met” so many great writer/bloggers! Hi. Thank you for your comment. 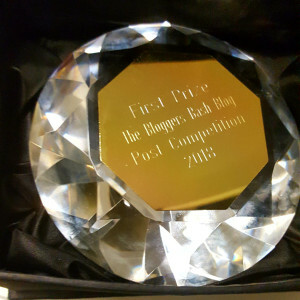 It was a lovely idea the #Cherished blog fest. 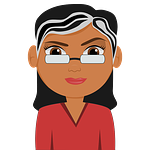 I’m so pleased I joined in too, and discovered some great blogs.